If you don't want to be lugging heavy coins around in your purse for the rest of your trip, try to spend as many of them as you can at the airport. Consider splurging on a fancy meal at a restaurant and leave the coins as a tip. You could buy small souvenirs for your friends back home, a book or magazines for the plane ride, or something to wear. If you have enough coinage, buy some new clothes for your upcoming destinations and throw out anything in your suitcase that is looking worn or soiled. You'd be surprised to know that you can often sell foreign coins online and make close to their value back. eBay is a great place to start doing this, so make sure to take a look at how much you could make before you consider leaving them. Most people want to have a souvenir or two from their travels. Small trinkets are a great way to remind yourself of the countries where you have traveled. One of the best ways to use old foreign coins is to display them in a pretty container. Simply clean your coins in soapy water or disinfectant and then find an interesting glass bottle to put them in. Place it on your windowsill or beside your bed to be reminded of the places you've been. If you're somewhere that has a Starbucks nearby, ask them to reload your card with your leftover currency before you leave the country. You'll then be able to spend the balance on your card when you're back in the United States without losing out on the exchange rate. UNICEF accepts unused foreign currency as a donation, thanks to their Change For Good promotion. Currently, ten international airlines support the Change for Good program. This global program has generated more than $156 million to be used by the charity. Gather the coins together before you board the plane, place them in the envelope that the airlines provide, and you won’t have to carry all of that extra weight on to your next destination. If you have a friend that has always wanted to travel, give your coins to them as a gift, especially if they're from a country your friend wants to visit. Make sure to clean them in soapy water before you give them away to get them back to their original, shiny state. 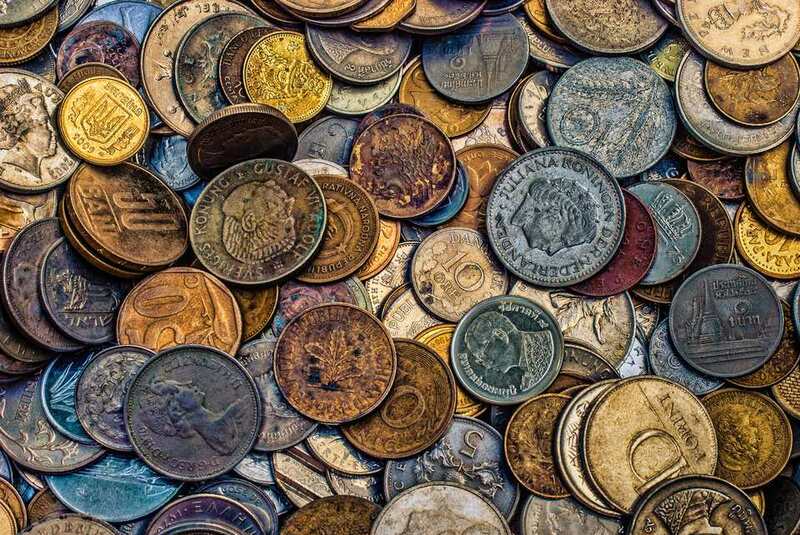 Coins from different countries can be used by teachers for a variety of lessons including history and banking. Most countries carefully choose the art for their coinage and often include historically significant emblems and famous people. Ask your local school or a teacher you know if they would like your leftover coins, especially the pre-Euro coins. If you have a drill at home, why not drill a small hole into the coins and string them up to make some jewelry? You could make some earrings with the Euros you have left from your trip to Spain, a bracelet linking coins from Southeast Asian countries, or a necklace with Mexican Pesos to remind you of your travels. You may want to keep your unused coins as a souvenir of your trip, in which case, turning them into magnets is a fun way to do it. Buy a magnetic board, along with a few small magnets, and glue them to the back of the coins. Now you can stick up your photos, tickets, and memories to the board, along with coins from the countries you’ve visited. New, in Great Britain, are kiosks where you can exchange your money, including coins. If you are looking for a quick, easy way to convert your leftover coins into US Dollars, Euros or Pounds, the Fourex kiosks are the way to go. They even accept out of circulation pre-Euro currency such as Deutschmarks, Pesetas, and Schillings. The Fourex website has a list of locations within the UK where you can find kiosks.